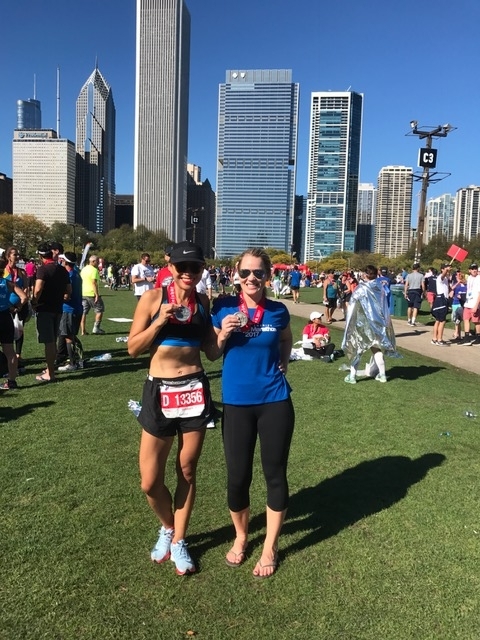 On Sunday, I ran the Chicago Marathon. 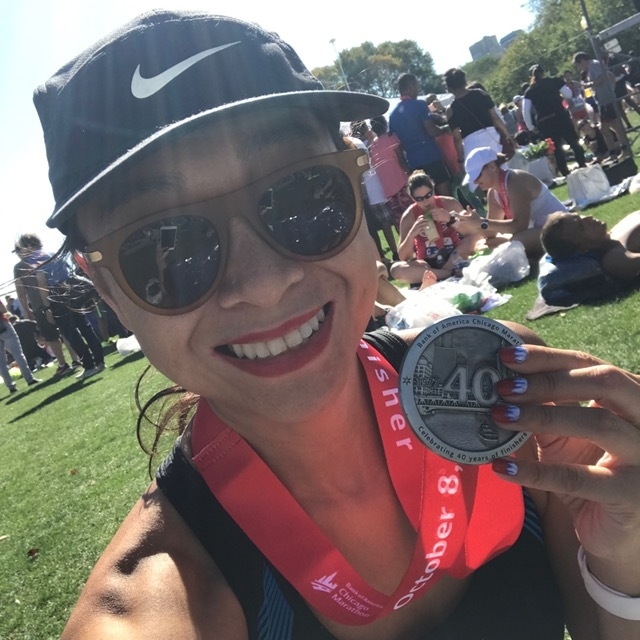 It was my tenth marathon and this was what I asked myself a few times around the middle of the race. I’d been toying with idea running another marathon in early November if Chicago didn’t go well. The last time I ran a marathon was two years ago in the Scotiabank Toronto Waterfront Marathon 2015. It is the longest break I’ve taken between marathons. Prior to that, since starting racing that distance, I’d done two a year (and one year I ran three). Because of this longer than usual break between fulls, I wasn’t quite sure how my race would go. This time I changed my training a bit. 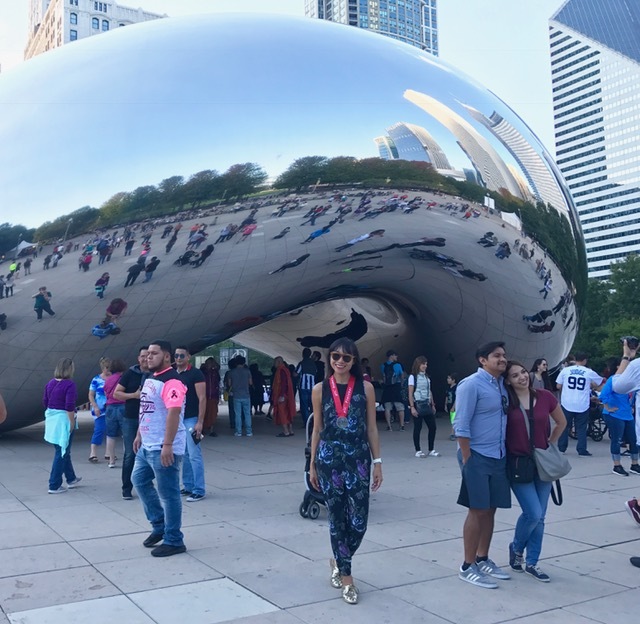 I ran more frequently: typically five times a week versus my usual three times a week (mostly it was the addition of two runs either at a recovery pace or easy pace). I also did a few random workouts other than running, such as hip hop dance class, yoga and Spinning. I was pretty diligent with my five runs a week, and got all my hill training done but faltered a bit once it came time to focus on speed training. Speed training is my least favourite, plus I had a few road trips that distracted me. And then about three weeks before race day, I caught a cold, which put me out of commission for more than a week. So I missed my 23k long run, and all of the other training that would’ve happened in that 10 days. All of which made me fret about not being prepared for the race. 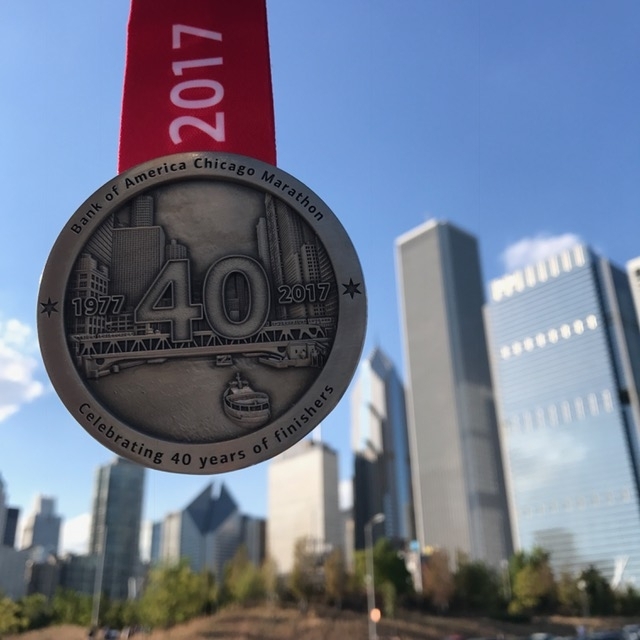 I’ve run Chicago once before and it remains my marathon PB. And even though I’d run it before, I recall very little of the race, other than there being so many great spectators, and that the route is flat. I ate more carbs than usual for the week prior to the race. And worried about the weather forecast, checking it once a day starting two weeks prior and working up to checking it multiple times a day. 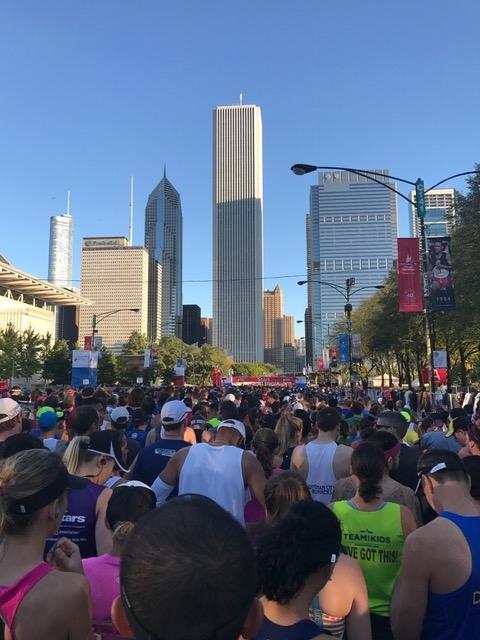 Having registered so many months before, I don’t recall entering an estimated finish time or a past marathon time, but somehow I ended up in corral D (aka a 3:40 marathon), so either I was ambitious or they based it on my 2014 Chicago Marathon time. Race day morning, we didn’t budget enough time to get into the race area, check a bag, and use the portapotty so ended up having to race to our corral, which we got into right before they closed it off at 7:20 a.m. There was time for a quick photo, though, and that beautiful glow to the buildings behind us is due to the beautiful sunrise glow. I had printed a pace band for 3:45 in kilometres, and also put on the Nike pace band in miles for the same time. I would have many technical difficulties that day, though. My Apple Watch did not have the NRC app because I’d had to reset it a couple of weeks prior and I had issues redownloading the app, so I had prepared to use the app on my phone; however, I did use the stopwatch on it so that I could check my time at each mile marker and compare to my pace tattoo. Also, I usually listen to Google Play Music when I run, and I had issues getting a phone signal for the first few k.
The first 27k or so went really well, though! My pace was quick and I was anywhere from two to three minutes ahead of the 3:45 goal time. I wasn’t sure if I could maintain that pace but I figured I had to try. “This is your race to lose, so just don’t, you got this,” I told myself, when I could tell my strength (both physically and mentally) started to falter. After about 27k, as it got later into the morning, it got very hot and sunny. My legs were feeling tired and I grabbed Gatorade at each station (I had been relying on the Gatorade I had with me — I used a fuel belt), while also splashing myself with water to cool down. I watched those few minutes I’d banked slip away from me. And then I could tell I wasn’t even going to PB, but I had no idea by how much time I was losing given my technical difficulties with my phone and my watch. On the bright side, I never experienced that feeling of not wanting to go on (in past races, I’ve often felt like it was just crawling by). I focused on just trucking on through and watched as each mile marker announced I was closer and closer to the finish. In that way, the race went by nice and quickly for me. The race attracts runners from more than 100 countries. And the sidelines are packed full pretty much the entire race. I watched runners stop to hug members of their family. And was boosted by the exuberant spectators with the cheers: the group of women cheering, “You got it, you got it, you got it, let’s go!” The signs with creative messages like “Run like millennials do from commitment!” and “Run like you forgot to turn off the frijoles!” and more than a few making fun of Trump. 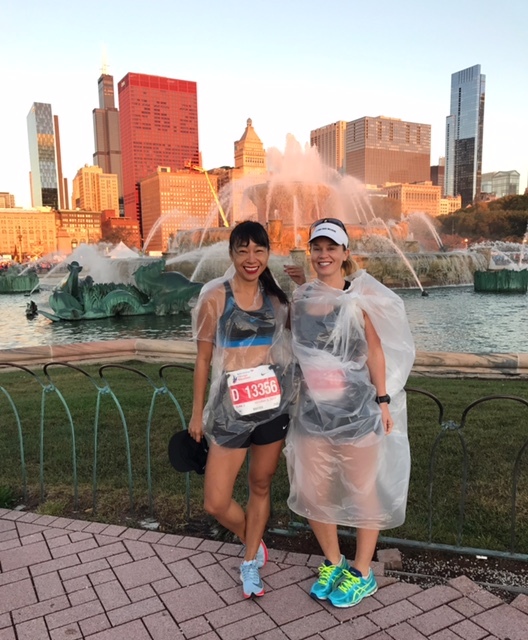 As for the route, I’m not super familiar with Chicago and I know the race goes through more than two dozen neighbourhoods, but I don’t feel the route is that scenic. To me, it all melds together as non-descript streets, other than one leafy residential area (I believe it was Lincoln Park) and of course, the skyscrapers of the downtown portions. It’s the spectators and that made certain parts of the route stand out. The huge Mexican contingent cheering and running was amazing, and there were people handing out paletas to runners. There were also at least two spots where people handed out beer, and one station with Jello shots. The cheerers, they make this one great race. 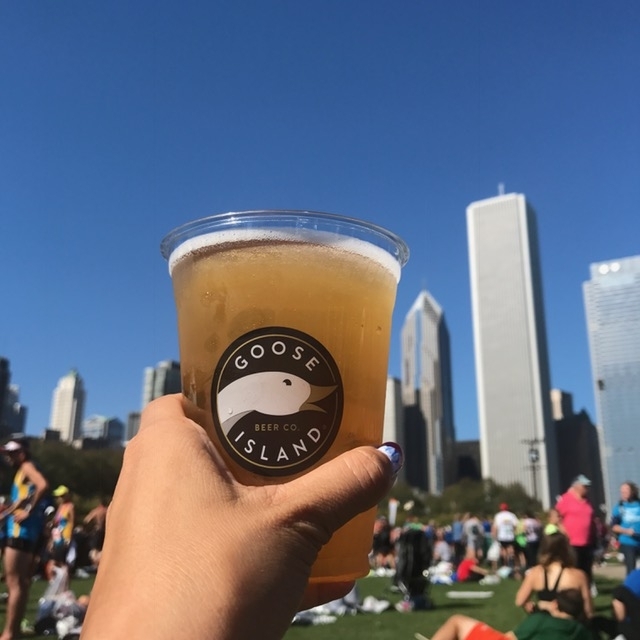 And the post-race party afterwards was just fun, with live music and there was a free beer you picked up in the finish chute area, plus another free Goose Island beer (there was a ticket attached to the bib) at the post-race party. Everyone hung around in the sunshine and celebrated their accomplishment. I loved watching runners and family find each other and there were big hugs and joy all around. I finished at 3:55:07, and given the hot conditions, I’m happy enough with that. I know a few runners who had bad races, and a few with great races. It’s my second fastest marathon, and I placed 9,407 out of 44,472 runners, and 2,637 out of 21.476 women, and 414 out of 3,543 in my category. After the race, and on Monday, there were loads of runners wearing their medals and/or race t-shirt, and we would congratulate each other, there was a beautiful friendly vibe that I somehow forgot about from the race in 2014. And now what? Well, I have to decide if I will run another marathon this fall… (gulp).